I laughed out loud at your comment about the lavender tea...that's exactly why I'm not a huge fan of floral teas. HA! 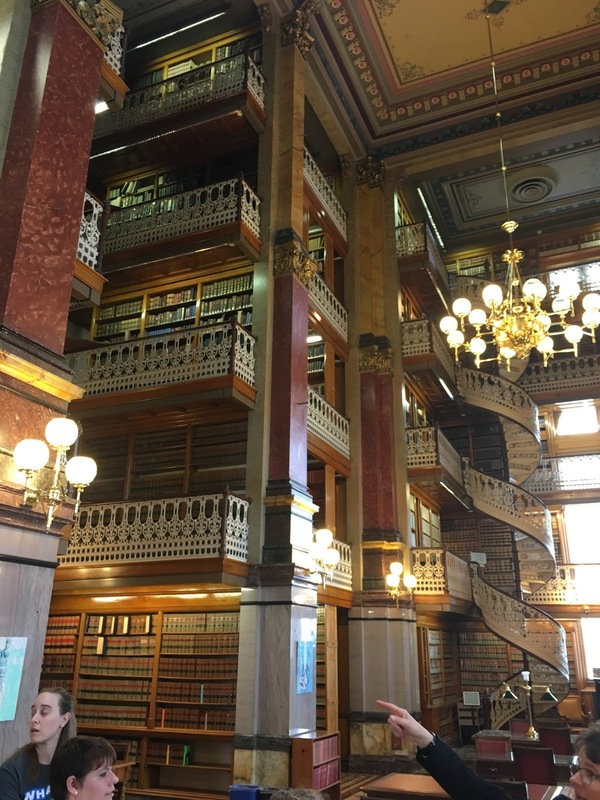 The library at Des Moines is gorgeous! When I drink tea I want it to taste like something, not just colored water. I couldn't agree more. I love a good, strong tea. Really perks you up in the afternoon. My British Grandmum always swore by an afternoon "cuppa" to get through the rest of the day. She was right. Really agree with the simplification of the makeup routine as we get older. As I've gotten older I wear less make up and spend more time on skin care. I still like a touch of concealer in strategic spots, but I prefer a tinted moisturizer to foundation. It's lighter and has an SPF. Always add a touch of mascara when I go out. And I never leave the house without lipstick. It's the best thing you can do for your face at any age. Being able to get ready for the day quickly is a really wonderful feeling, isn't it? On days that I don't have to wash my hair, I can be showered, dressed, and makeup on in less than a half hour. I've learned that I don't have to wash and style (flat iron) my hair every day. I can do it every 3 days and wear a shower cap the other days. De-cluttering that routine has freed me up, just as you have been freed up. 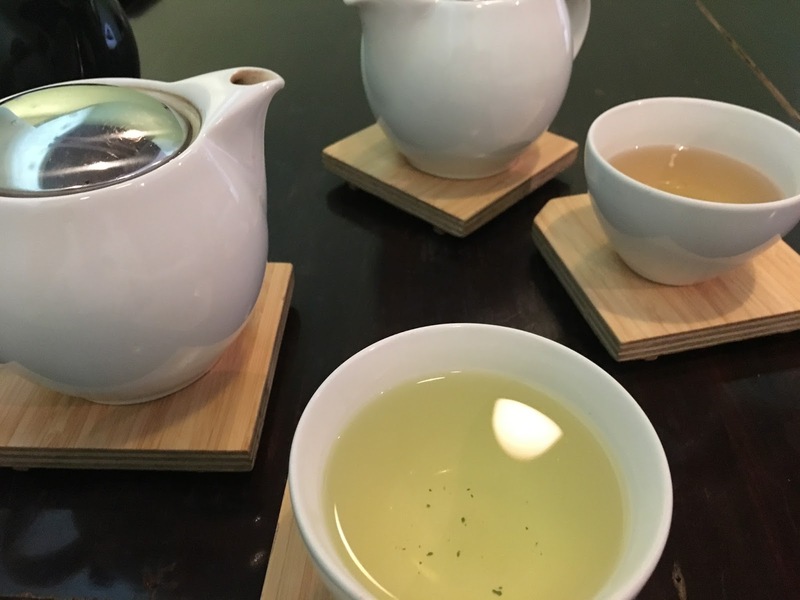 I like herbal teas, but a cup of macha tea nearly did me in. It was like drinking lawn cuttings steeped in hot water! I hardly use a thing on my face, but it is pure laziness and not a skin-care choice. I wash and moisturise and apply lipstick. A really big occasion calls for eyeliner and new mascara, which is invariable thrown out after one use in three months! I stopped wearing mascara when I grew out the colour in my hair, these days it is a little bronzer in the summer and a little lipstick. I have found it all quite liberating. Had some jasmine tea recently that was the most delicious bath water I had ever tasted. What a funny line, Deborah! My grandmother also had beautiful skin all her life. She never used soap on her face. Gorgeous library! Love your decluttering, Deborah. At the beach, of course, I wear nothing but sunscreen and moisturizers. Even though I use very little other makeup (much like your grandma), it still felt great with even less. I'm using more makeup than I did for many years but I'm not trying new things all the time. I've figured out what works for me, winter and summer (pale and less-pale, haha) and it takes less time to put it on than when I was searching for the right products. Winter is Bobbi Brown foundation stick, BB vanilla longwear eyeshadow with some liner, and mascara (still searching for my perfect mascara). I've got about five winter lip choices, but most of the time I'm wearing Clinique Black Honey. Summer I change the color of the eyeshadow to taupe or darker, but it still takes less than a minute to apply and blend. I switch to IT Your Skin But Better which takes a bit more blending, but in the summer I wear one of two lip colors only, so that doesn't take any time at all (a light gloss or a darker Bare Minerals lip color). I like not having to think about it, but I don't mind spending a few minutes applying it because it makes a huge difference to how polished I feel. I was pretty makeup-less for years. The tea! Ha. Good point, as it's true quite a lot. I have go back and read your post on makeup. I'm so much like you in loving new products and packaging. As products evolve and new ways to make yourself look purdy become the talk of the town, I'm right on board. I just figured out how to use bronzer and I can't believe how much I looked like an old lady before with my white powdered skin and pink cheeks! I place all the blame for wanting new stuff on those makeup videos on You Tube. I recent;y bought several acrylic organizers and have everything somewhat organized. I'm awaiting an order from Sephora---hope it fits. As far as a trip, I may need another piece of luggage. Thanks for your visit. I'm hanging there. I drink a Breakfast in Paris tea that is black, with a hint of lavender, and it's okay. But I don't really like floral teas. Mint, yes. I've never used soap on my face - Bonne Bell's 10-06 in my teens, then other cleansers, and now a Vichy 3 in 1 product that takes off the mascara that I like to wear. No foundation, though. Guess I need to take in the DM Library on my next visit. I think DM is so lovely! I just can't see how I can do less with my beauty routine but, you are so right, it sure would make traveling so much easier. Happy rest of the week! I'm so with you on floral teas, Deborah! I just can't drink them. Your line about drinking bath water was priceless and pretty much sums it up. I'm glad you were able to visit both of your sons and get ready quickly with your less is more beauty routine. You're already beautiful both inside and out! That library is incredibly beautiful! WOW!!!!! I have never been nor probably ever be in Idaho - I haven't seen much of that part of our lovely US of A. That library is good incentive to get out of town, I tell ya! Keep up the good work on your less is more mantra - and pray I get the bug too. I sorta dropped the ball and haven't done much else with the basement. I feel shame, haha. Enjoy this gorgeous weather! Hugs! Amazing library! I'm glad to hear you are enjoying your simplified routine. I enjoy the days I stay home all day and can just use nothing on my face. I occasionally enjoy lavender tea--but it can make me sleepy! "Less is more" is definitely a freeing thing! Glad you've been able to travel to see your boys. That photo of the room and the staircase is gorgeous! I had to giggle about the lavender "bath water" tea - haha!! Guess that having been brought up in Europe where it is the norm that a home has only ONE bathroom for the entire family, you learn early on that minimizing is key! Back in The Netherlands, all the homes we've lived had but one bathroom and also in Italy. In Indonesia of course only one bathroom as it is even more crowded there. I've never had to tote that much around, only one small toilet bag with hairbrush and tooth paste + brush being the key things in there. Just the basics for other skin care and I've always used a good brand like Chanel for a cream with SPF since we worked a lot in the tropics. Glad you're enjoying your new found or new learned freedom! Deborah, I never use soap on my face. And I don't wear perfume because it gives me a headache. I wish I could because it makes me feel more ladylike. But many places don't allow scents any longer so it's just as well. I do drink a lot of water. I wear only moisturizer, blush, mascara, a pencil liner, and lipstick if I go out. I'm too pale to go without them. It doesn't take me long at all to get ready except for my hair. I have to iron it every day and I have to wash it every second day because it drives me crazy if I don't. Some gals I know can go almost a week but not me unfortunately. I have tried but my hair just gets greasy too fast. I'm not fond of flowery tea either. I think tea should have a nice flavour and one that makes you feel pampered. Tea is something that I refuse to drink unless I can sit and savour it. If I have to rush, then I don't enjoy it. It is a blessing that you can visit your sons once in a while! I have one who lives here on the Island but the other two live too far away and I can't travel far which is unfortunate. So my guys try to get home at least once a year. That means the world to me! You certainly have beautfiul skin too - like your grandmother- you lucky girls! Sometimes I feel I use too much foundation to try and cover some of the lines and wrinkles but cetrtainly to no avail - I too am trying to de-clutter that part of my life. I will take some of your tips to heart. ♥ Loving your posts! I'm not as brave as you to go cold turkey:) but there are some days I use less makeup than others. My aunt (who died at age 94) and my mother (almost 90) were blessed with wonderful skin...I hope I have inherited some of their genes:) My aunt once told me she never used anything on her face other than POND's Cold Cream. She wore a little lipstick and "rouge" and had almost no wrinkles when she died. I should have invested in POND's years ago!!! I found that it was a relief to stop buying skin and make-up 'stuff', and now am just steadily working my way through what I already have. When I've done that - I hope to work out how to use even less. There are times when all I use is moisturizer and lipstick. Rarely mascara anymore, but I do get the urge once in a while. Sometimes I'll use a little bronzing powder if I'm feeling especially pale. Less is more... so freeing. Enjoyed hearing about your own discoveries and journey through the makeup bag or drawer.